FRANKFURT (Reuters) - Stada has invited rival suitors Cinven Partners and Advent International to the negotiating table, the German generic drugs and consumer care group said on Monday, after months of courtship. The prospect of a bidding war drove shares in Stada as much as 14 percent higher after the drugmaker initially said it was weighing two takeover approaches, including one from Cinven which valued it at almost 3.5 billion euros (3 billion pounds). It later named Advent as the second prospective bidder. Seeking investments in stable healthcare businesses, cash-rich buyout firms -- also including Permira and CVC - have been working on offers for months and approached Stada about a deal, people familiar with the situation told Reuters. Stada's share price, inflated by persistent takeover speculation, and opposition from supervisory board chairman Carl Ferdinand Oetker, part of the German family-owned food group, have previously stood in the way of a deal, these sources added. Stada said its executive board "started open-minded talks to allow the interested parties to explain their strategic concepts and evaluate further value-enhancing potential with regards to the potential offer price". Cinven had been preparing a joint bid with Poland's unlisted Polpharma SA to combine the two drugs businesses and cut costs, a person familiar with the matter told Reuters. The buyout firm decided to go it alone when the venture proved too complicated, the source added. Polpharma was not immediately available for comment. While Stada said that Cinven was offering 56 euros per share, it did not disclose the price proposed by Advent. The private equity groups declined to comment. 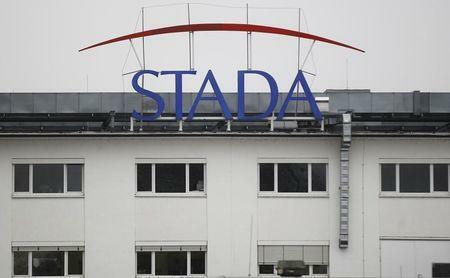 Stada shares jumped 13.7 percent to 56.5 euros on Monday, on course to close at a record high. The approaches vindicate the strategy of activist investor Active Ownership Capital (AOC), which built a stake of about 7 percent in shares and options before May last year when the shares were trading at around 30 euros apiece. AOC was set up by former investment bankers Florian Schuhbauer and Klaus Roehrig and Stada marked the firm's first major investment. Under its former CEO Hartmut Retzlaff, Stada had steered clear of major merger deals when the generic drug industry began consolidating to cut costs, driven by larger players including Teva and Allergan . Retzlaff stepped down last August after more than two decades at the helm. A source close to one of the bidders said that supervisory board, which previously opposed a sale, has become more open to considering bids, even though this will likely result in a breakup of Stada. Founded in 1895 in Dresden as a pharmacists' cooperative, Stada is seeking to expand its non-prescription consumer care business. Its generic drug business is under price pressure as medical insurers in Germany, its largest market, are seeking bulk procurement deals at low prices. Sources familiar with potential bidders say that a new owner will likely separate the two businesses -- a challenge because Stada is largely managed along regional or country divisions which combine generics and consumer care lines of business. Jefferies analyst James Vane-Tempest said Cinven's 56 euros amounted to a fair deal, given Stada's high net debt levels, which stood at about 1.2 billion in September, and limited organic growth prospects. "Although Stada does have a decent branded products business, a strong position in Russia and a pan European distribution platform, in our view it had been a big ask to command a significant premium on the rest of the business, which is the larger segment."